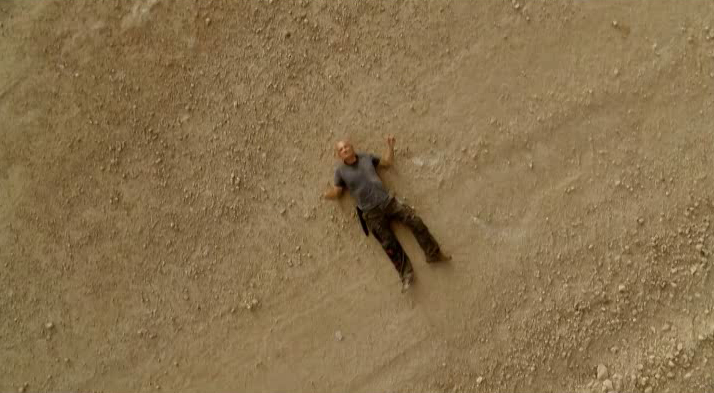 Locke flashes to Tunisia, off the island to the same location Ben arrived after he turned the wheel. He is taken back to a camp where his broken leg (You remember his broken leg, right? The same one he broke in Episode 001) is looked at by doctors. It turns out Charles Widmore is the one that found him, and wants Locke to bring back everyone to the island in preparation for 'the war'. Locke is taken by Matthew Abbadon to visit Sayid, in the Dominican Republic, Hurley at Santa Rosa, and Kate in Los Angeles. He's turned down by each of them. He also goes to visit Walt in New York. He finds out Helen has died, and visits her grave. Afterwords, Abbadon is shot and killed by Ben Linus, and Locke attempts to drive away in his car and is in an accident. He wakes up in a hospital, with Jack at his side. He tries to convince Jack to come back, but he won't go. Locke decides to kill himself out of desperation, but is stopped by Ben. Ben finds out what Locke's plan is to get back to the island, finds out that he's supposed to see Eloise Hawking, and then kills him. Jack begins flying on flights over the Pacific in hopes of crashing on the island when he discovers that Locke has died in the newspaper. After he lands, he goes to a bridge and stands on the edge, contemplating suicide, when a car crashes and bursts into flames. Jack saves the woman and her son. Jack goes to visit Locke's coffin at the funeral home. Walt comes to visit Hurley at Santa Rosa, to find out why they were all lying about what happened. We end the episode with Jack going on a drunken tirade with the chief or surgery at the hospital. The episode is 59:18 and is 481MB to download. You can stream the episode below (via Facebook), or go here to use torrents (better quality, recommended) to download the episodes to your computer.